The shallow subsurface of karst systems (soil and epikarst) plays an important role in karst recharge processes. However, only a little research that directly characterized this zone has been conducted. In this paper, we review previous studies that focus on the soil and epikarst recharge processes, in particular on diffuse recharge processes. The literature is categorized by processes, methods and controlling factors, summarized in an overview table, and discussed in detail. Finally, new directions to advance research toward a better understanding of the hydrological dynamics in the karstic shallow subsurface are derived. This work was funded by the Emmy Noether-Programme of the German Research Foundation (DFG; grant number HA 8113/1-1). Champollion, C., S. Devile, J. Chéry, E. Doerflinger, N. Le Moigne, R. Bayer, and P. Vernant. 2017. ‘Estimating Epikarst Water Storage by Time-Lapse Surface to Depth Gravity Measurements’. Hydrol. Earth Syst. Sci. Discuss. 2017 (August): 1–27. https://doi.org/10.5194/hess-2016-355. ———. 2008a. 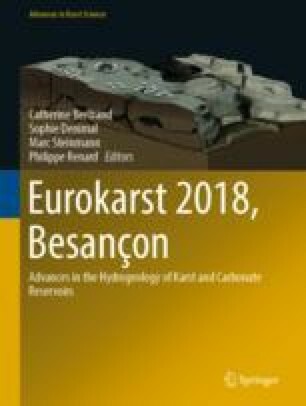 ‘The Role of the Epikarst in Karst and Cave Hydrogeology: A Review’. International Journal of Speleology 37 (1). http://dx.doi.org/10.5038/1827-806X.37.1.1.